Violet is approaching that crazy age – come on you know what I’m talk about. That age in infancy where you suddenly realize….this is a real person I have on my hands, and I’m actually supposed to teach it to eat food – like REAL food, real honest to goodness people food. If you’re a first time mom you probably frantically read articles, books, and message boards trying to learn everything you’re supposed to know about babies and real people food. I remember that feeling with Jacob so vividly, and I recall thinking a hundred million times that I was going to “break” him and someone was going to knock on my door and say “I’m sorry Melissa, but there’s been mistake, you’re not good enough to have this boy” – but they never came, and trust me I am beyond perfection in anything I do. Yes, Violet is indeed turning 6 months old in just a few shorts weeks and so in preparation for her first taste of real human, living people food – I am starting these Home Made Baby Food Chronicles on my blog so that I can share my adventure in making home made baby good goodness…….Jacob had a few things home made but I can definitely say he at a lot more jar food then food I prepared with my own hands in the early days – but I’ve grown and changed since then in my parenting style and this idea just sits well within me. 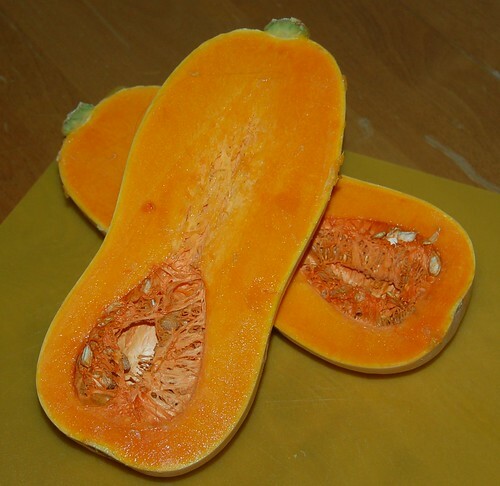 A great first Vegetable for Babies is Butternut Squash so I found a nice squash at a local Market which I paid $1.29 for. 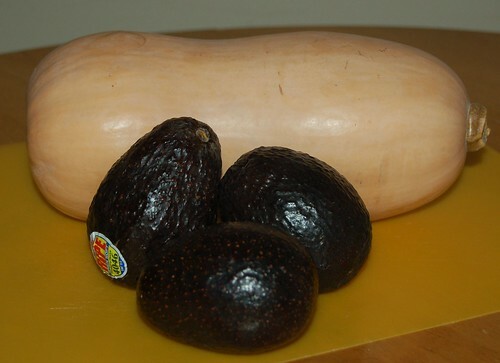 You’ll notice the avocado in this picture but those little fellas are featured in my next Home Made Baby Food Chronicle! 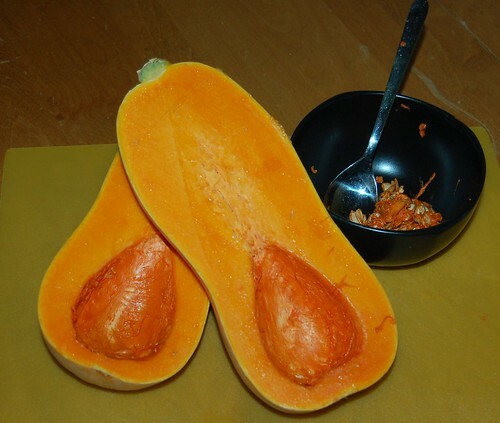 Then scooped out the seedy, stringy, not so good for pureeing stuff…. 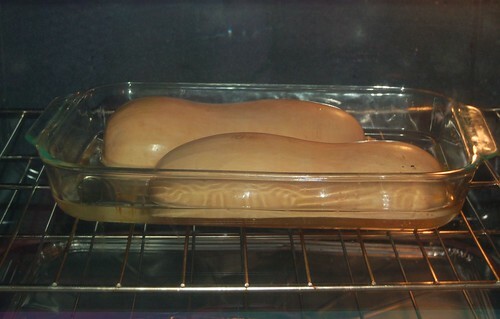 I placed the squash halves face down in a baking dish with about one inch of water. I used distilled water that we had on hand but you do not have to do this, regular tap water is fine no matter what those baby companies try to tell you! The little fellas went for a nice sun tan in the oven for about 50 minutes with the oven at (as previously mentioned) 450 degrees Fahrenheit. 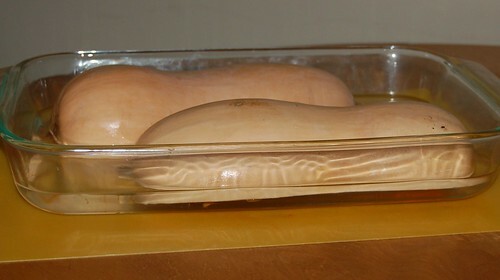 Your squash should look like this when you remove it from the baking dish – I opted to save about a half cup of the water from the baking dish, just in case the squash needed any liquid to help it puree down – in this case it did not. 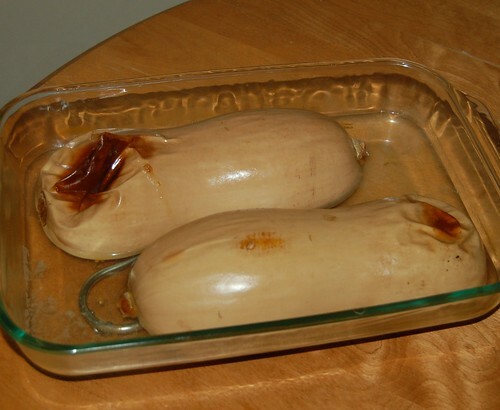 It was recommended to me to save the water the vegetable was cooked in because any nutrients that seeped out during the cooking process can now be found in the water – sounds reasonable to me so I kept it just in case. 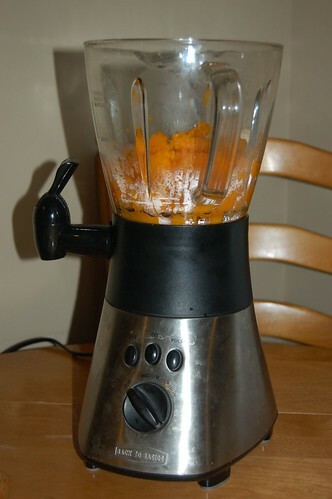 Next I scooped the squash from its shell and placed it into our blender/food processor. 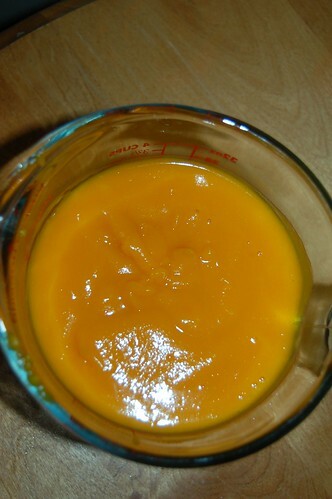 It looked like this prior to being pureed…. 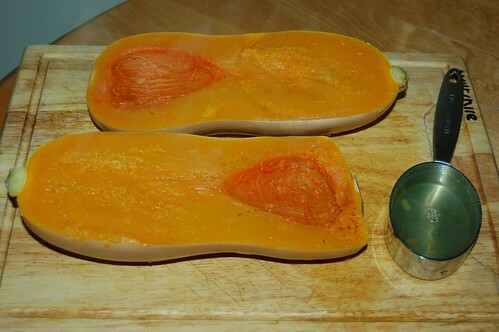 This squash yielded just about 4 cups of puree. 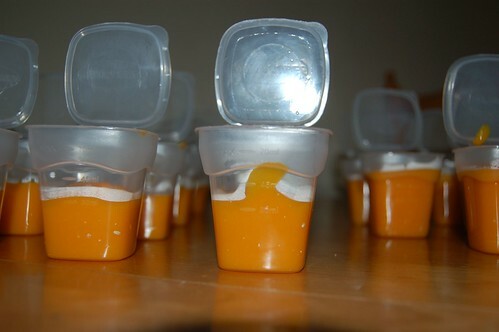 I poured it out into storage containers and was able to get 12 servings consisting of 1 ounce each….and 5 servings consisting of 2 ounces. Wow! That’s a lot of feedings for just $1.29 and an hour and ten minutes of my time! 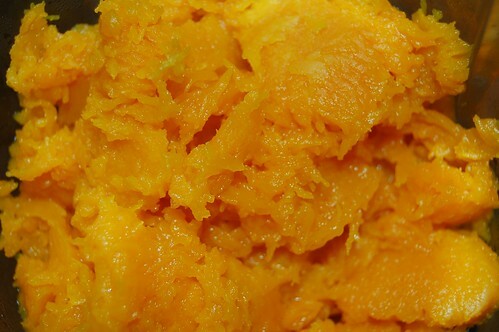 It wasn’t even really an hour and ten minutes of my time because I surfed the web and tidied up while the squash baked! Not too much longer now and Violet will be able to enjoy the fruits….errr vegetables of my labor! Awesome! I hope she loves it. 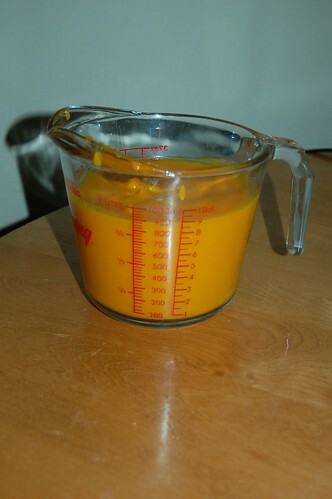 Adrian was a little stinker and hated the texture of thawed, previously frozen, baby food. It’s really about the same texture as storebought jarred baby food for most things. He hated that, too. I got used to making itsy bitsy batches of food for him. Three or four servings at a time. I moved on to pureeing whatever we were eating for dinner using our Magic Bullet pretty quickly, once he proved he could handle all the single ingredient stuff (he started eating solids at 4 months and was on pureed table food at 7 months). Made my life much easier. Luckily he has no texture issues anymore and will eat anything and everything. 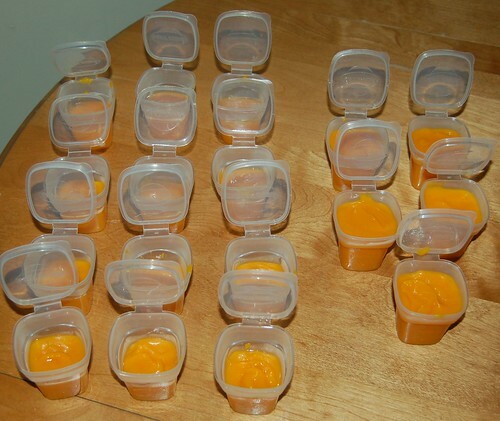 It sure is crazy how much baby food you can get out of REAL food compared to the same price for the jarred stuff!